Company: Serrasalmus rhombeus (White Piranha) are best suited to a large species aquarium where they are kept in schools of five or more. 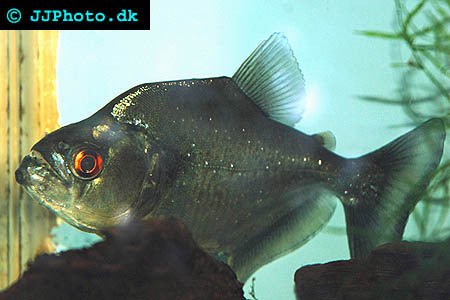 Aquarium setup: Serrasalmus rhombeus (White Piranha) requires a large well filtered aquarium due to their large size. The aquarium should be decorated with a lot of roots and rocks creating hiding places for the fishes. The aquarium should also contain a lot of plants and parts of the aquarium should be densely planted. Add floating plants to dim lighting. Feeding: White Piranhas should be feed live food. 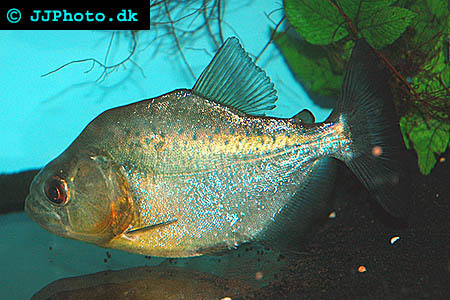 Breeding: Serrasalmus rhombeus (White Piranha) can be breed in captivity however it is very rare. They breed similar to other Piranha species, where the fry hatch in two days and become free-swimming a week later.